To investigate risk factors for, and the influence of premature mortality on, dementia complicating type 2 diabetes. Participants with type 2 diabetes in the community-based observational Fremantle Diabetes Study Phase 1 (n = 1291, mean age 64.0 years) were followed from 1993 to 1996 to end-June 2012. Incident dementia was identified from validated health databases. Dementia risk was assessed using Cox proportional hazards modelling supplemented by competing risk regression modelling in the total cohort and sub-groups defined by age of diabetes onset as mid-life (< 65 years) or late-life (≥ 65 years). During mean ± SD follow-up of 12.7 ± 5.9 years, 717 participants (55.5%) died and 180 (13.9%) developed dementia. Overall, few risk factors predicted incident dementia and most predicted time to death. 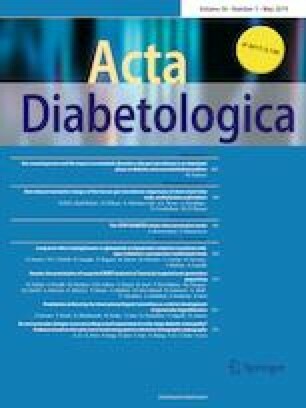 In mid-life diabetes, incident dementia was predicted by diabetes duration, cerebrovascular disease, schizophrenia, antipsychotic medication and the APOE ε4 allele. In late-life diabetes, risk factors were peripheral neuropathy, lack of exercise, lower fasting serum glucose, no antihypertensive therapy and the APOE ε4 allele. Competing risk analysis showed age to be a positive predictor compared with the inverse association in Cox models that suggested survivor bias in an older community-based cohort. Dementia in type 2 diabetes is multifactorial. An association with diabetes duration, independent of most possible confounders, suggests that one or more unmeasured processes specific to diabetes may be implicated in the pathogenesis. The risk factors for dementia were also associated with an increased risk of death. This suggests that recently reported improvements in mortality in type 2 diabetes may be accompanied by reductions in dementia incidence. The online version of this article ( https://doi.org/10.1007/s00592-019-01322-9) contains supplementary material, which is available to authorized users. The authors thank the Fremantle Diabetes Study staff, investigators, and participants, and the staff at the Western Australian Data Linkage Branch. This work was supported by the Raine Foundation of the University of Western Australia and the Fremantle Hospital Medical Research Foundation. TMED was supported by a National Health and Medical Research Council of Australia Practitioner Fellowship (Grant number 1058260). The study sponsors had no role in the design, methods, recruitment of participants, data collection, analysis or preparation of the paper.